Top Gun was brought back to Australia around August 2007 from New Zealand. Under the previous ownership the boat underwent a new 496 and merc 6 drive. On its return to Australia it was pulled down immediately by S MA Race Marine of Kirrawee. It underwent some radical changes in regards to cam and heads, bottom end remained unchanged and Top gun was ready to start the 2007-2008 ski racing season in unlimited. We dragged the “Teletubbies: DC & Vardy” off the lounge for the Hawkesbury120, Grafton and Sydney Bridge to Bridge. Hawkesbury 120 resulted in a win and record, same was for Grafton and in the Bridge to Bridge “Puffing Billy’s” wetsuit zipper broke at the start on Danger Island due to him putting on 25 kilos prior to the event by holidaying in the US. He was taped up with 100mph tape, started, and by Wisemans was knackered so we slipped off the pace to run 2nd to “Hazy”. The Aussie titles saw us grab a first in 40-50 men’s with DC and a second in 30-40 men’s with Vardy. 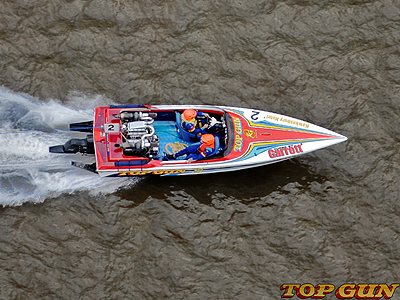 The start of 2008 the young guns of Jed Coey and Craig Gordon took on the four Murray River races with good results, 2nd Murray Bridge Unlimited, 3rd Southern 80 unlimited, 3nd Robinvale and 3rd again in Mildura over Easter. In doing so we took out first in unlimited for the 2007-2008 season in the SRA Super Series. A credit goes to Simon and staff of SMA Race Marine for keeping the boat on the water and finishing every race for the season, his passion and dedication for race boats is foremost.